A thought-provoking Nature article has been making the rounds on the Twittersphere: “Science’s attitudes must reflect a world in crisis.” In it, Colin Macilwain paints an interesting and worrying picture of threats to science. He sees them not as particular, national concerns but as a single global problem. It’s easy to see threats to funding as diverse and isolated events. Certainly the threats are largely flagged up when it’s time for a particular government’s new budget – hence the furore recently over research funding in the US. The first and most sunny, with more globalization and high engagement, would see a series of positive outcomes, including much more interdisciplinary research. The second – more globalization but low engagement – is rather like what we had before the crash, only worse. The ICSU PowerPoint slide for this showed bunches of vainglorious yuppies with mobile phones and portable computers, doubtless creating more gizmos and expensive drugs that most people in the world can’t afford. The third scenario would have more nationalism, with high engagement. That might create a series of little Denmarks pulling away from each other to deal with their own problems, with their own research strategies and regulatory regimes. Finally, and most ominously, there’s more nationalism, with less engagement. This predicts old-fashioned, stick-to-your-knitting, single-discipline science, aligned with resurgent nationalism. The slide for this one had a mushroom cloud at one stage, but Marks [the task force leader] settled for a barely more reassuring image of some darkly lurking battleships. But to me, it seems somewhat futile to anticipate the future of science without taking into account the economics of what lies ahead (which I would say, wouldn’t I, since it’s the idea PST is founded upon). The concept of globalisation, at least, is intimately tied to economics. Though nationalism may be undesirable for a variety of reasons, it’s strongly historically linked to economic turmoil, and can be seen already in the stricter immigration rules that threaten to keep scientists from coming to the UK. As for engagement, it’s economic too, in a less direct way. That is, if there aren’t as many funds around, it’s hard for scientists to fire off enough grant applications to keep their labs running, let alone sponsoring community outreach days and writing letters to the editor. And ultimately, I think both of these issues are less relevant, in fact, than funding. 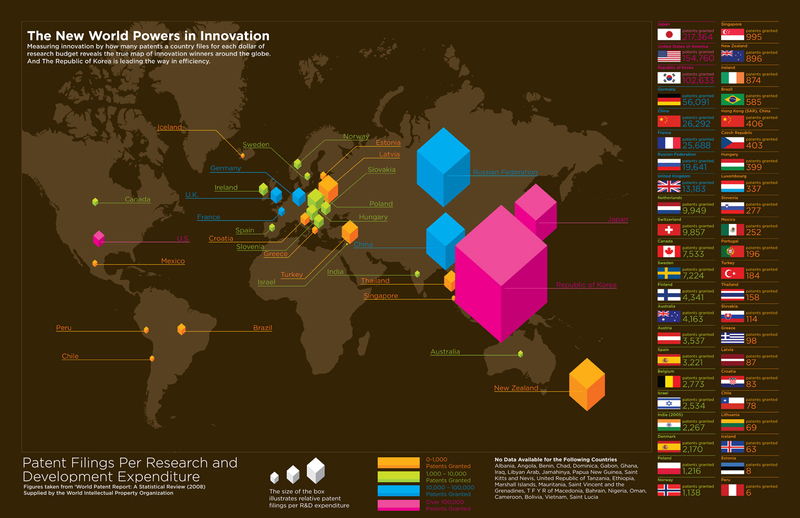 It’s no accident that patent filings tend to correlate with a country’s spending on R&D (see map – though the US and New Zealand are outliers according to this data). More than globalisation or engagement, I worry, it’s funding that will chart the future of science. And a future in which science spending is not prioritised will be one with less science – just that frighteningly simple.